Wouldn't it be nice to have a useful business lead list full of comptrollers already built for you? 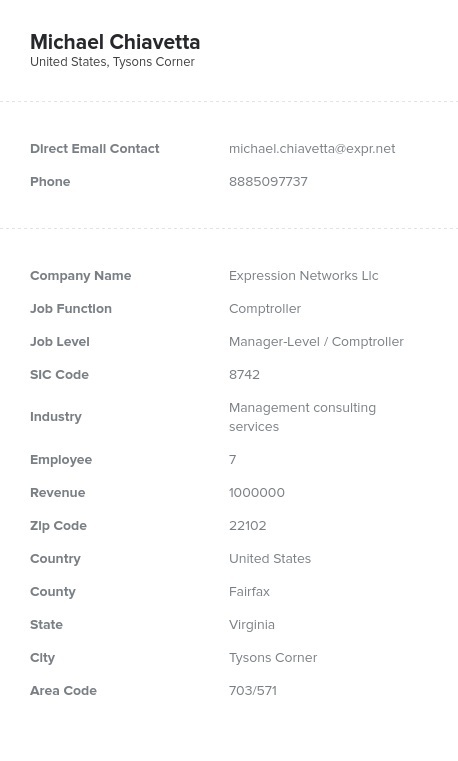 Well, we at Bookyourdata.com have compiled a comptroller mailing list full of all the important contact information you need: comptrollers' email addresses, phone numbers, postal addresses, and more! Buy a verified comptroller email list to get connected with your target B2B audience in moments and start emailing, cold-calling, or sending mail to a spread-out group of finance-focused professionals. A comptroller often serves as the chief in many types of financial affairs, including their most important function: managing internal audits. They often are charged with finding mistakes and issues with financial information, going over files and data with a fine-tooth comb. These essential business professionals serve in companies and public offices, managing or working with accountants and auditors. Comptrolling managers and professionals can be an important group of sales leads to reach out to. They often need a great deal of software, tools, outsourced services, consultation, and staff to get the job done properly. They also have a great deal of sway in the organizations they serve, as issues they find can have a profound impact on their entire company. If you have a product or service that can help them, email leads now with our affordable email database of comptrollers. This organized, ready-to-download .CSV file has the data of numerous leaders of comptrolling offices and departments, the types of professionals you want to get in touch with. Buy it and start networking with comptrollers now!